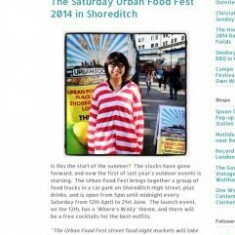 Shoreditch High Street in East London is every hipster’s Saturday night location of choice….and now also the residence of the free entry coolest new street food night market: The Urban Food Fest. This street food market has an ever changing selection of London’s street food trucks, as well as London’s best stocked car park bar! Drinks include: beer, english cider, flavoured cider, pimms, elderflower cocktails, bellinis, prosecco, various wines and usual classics. Prices are very cheap, ensuring a good night out with friends. Every weekend 4 different live bands and singers perform at the event. These are the rising stars, some are already signed to record labels and some are up and coming. Additional fun activities include face painting, massage chairs and caricature artists.